Ute has a Master degree in Biology with the main emphasis on Zoology and Human Biology, is a qualified Life Coach using different tools like Emotional Freedom Techniques, Numerology, Goal Setting, Weight & Stress Management and Dream Analysis. At this event, she is going to offer Numerology consultations, taster sessions in Emotional Freedom Techniques (EFT, Meridian Tapping) and will give information on her work in general. 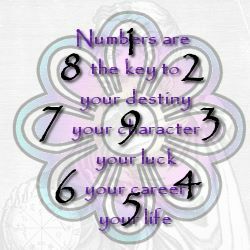 So what is numerology all about? Numerology is the universal language of numbers. By breaking down the patterns of the universe into numbers, we are able to uncover information about the world as a whole, as well as every individual. In Numerology it is believed that everything in the world is depending upon the mystical properties of numbers which come from the numbers inherent vibration. Using numerology, you can discover your strengths and weaknesses, inner needs, emotional reactions, and ways of dealing with others, as well as your talents. You can help yourself by becoming aware of your own character and learning to understand others. In daily life numerology can guide you with – e.g. What is my destiny, my life purpose? What is the right career for me? Who is my perfect match or soulmate? What are my talents? What are my main challenges? What is this year all about? And so much more.